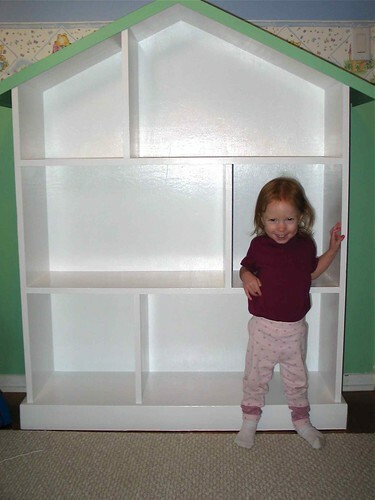 Kelly saw this bookcase in a Pottery Barn Kids catalog, and thought it would be really cute for Mattey. Problem: Bookcase from Pottery Barn Kids cost $350. Solution: Buy $60 worth of materials and ask Dad to help make it. Dad and I spent a couple nights working on it, and then Kelly applied the finishing touches. Thanks and we had a lot of fun working on it. We have some very rough sketches with some measurements, but no detailed blueprints.